LiveCode LessonsLiveCode LessonsHow To - LiveCode Mobile Tasks iOS TasksHow do I Create a Development Profile for iOS? How do I Create a Development Profile for iOS? This lesson describes how to set up a development provisioning profile that can be used for applications built with LiveCode. 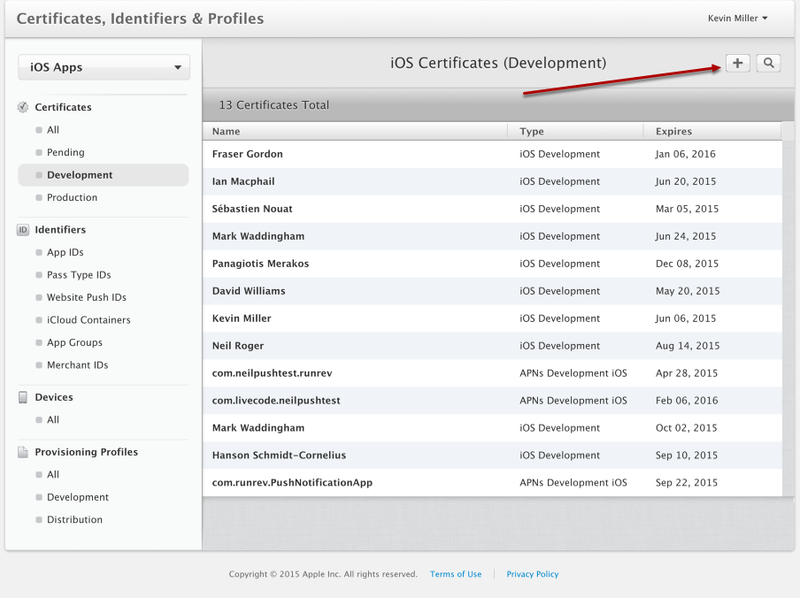 It is assumed that you have signed up to the iOS Apple Developer Program. This process is very similar to creating a distribution profile (http://lessons.runrev.com/m/4069/l/32957-how-do-i-create-a-distribution-profile-for-ios) so a few steps will be duplicates. 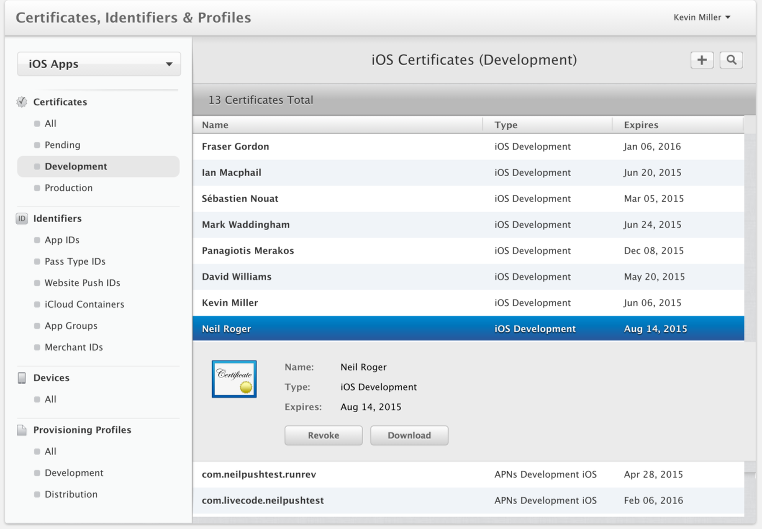 A development profile is required if want to test your application on any iOS devices that you have access too. The information discussed here is reduced and is also covered on the apple iOS Provisioning Portal website. You can access that additional information by logging into the iOS provisioning portal that is accessible from: https://developer.apple.com/. Protocol (OSCP) and Certificate Revocation List (CRL) are set to Off. highlighted, otherwise the Provisioning Portal will not accept your certificate request. address is the same as the one you used when you registered as an iOS Developer. same as the one you used when you registered as an iOS Developer. 5. A CA Email Address is not required. request to be stored. Specify a location and select Save. 10. The certificate is then generated and written to the file you specified under step 8. After you have generated a certificate signing request, you need to submit your certificate for approval. 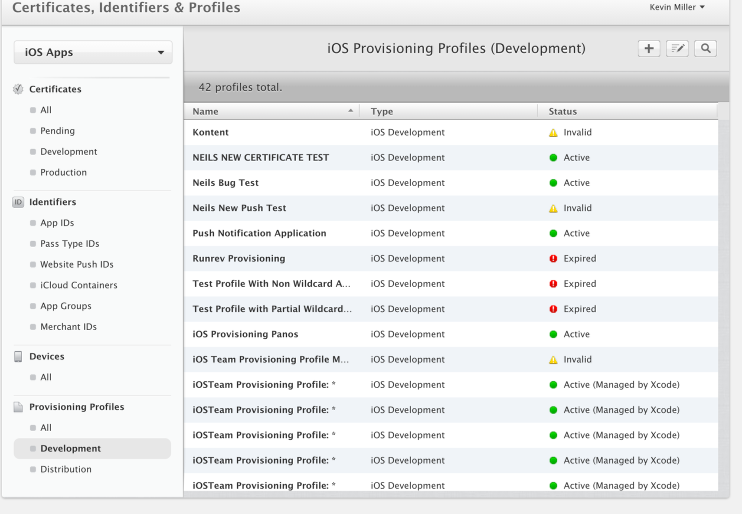 Log into the iOS Provisioning Portal that is accessible from: https://developer.apple.com/account/ios/certificate/certificateList.action. 1. 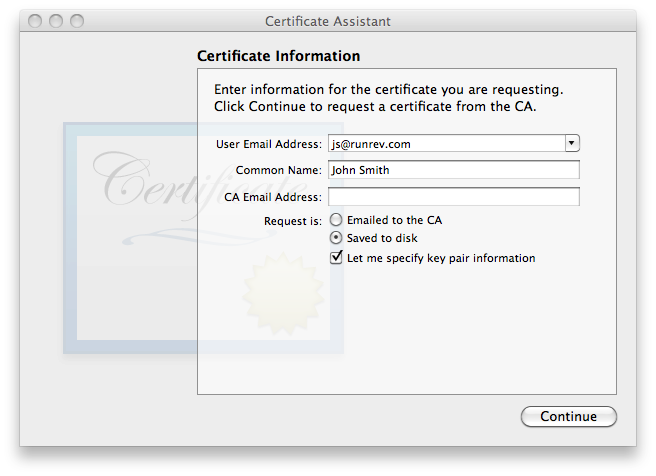 Select the Add Certificate button. 3. On next screen press "Continue"
4. On next screen select "Choose File" and select the certificate you created in previous step and then press "Generate"
5. Download Generated certificate by clicking the "Download" button. If you by chance navigated away from this page, dont worry. Simply press the development tab again, select your Name and then press the "Download" button. This is shown in the screenshot above. 1. 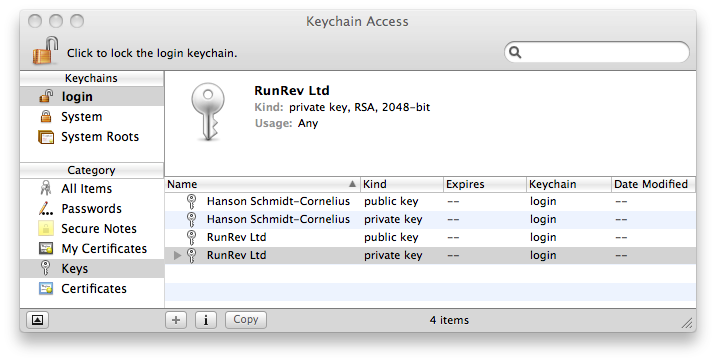 Open the application Keychain Access.app that is stored in Applications/Utilities. 3. Highlight the private key associated with the distribution certificate. 4. Select File > Export Items. 5. A window opens that allows you to specify where you would like to save your certificate. 6. Select Personal Information Exchange (.p12) as file format. 7. Select the file name. 9. You are prompted for passwords that allow you to access the key in the future. In this example, we will be creating a wildcard app ID. 3) Fill in the "App ID Description"
2) Give your device a name and enter its unique ID. The easiest way to find the uniqueID is to connect your iOS to your computer, open Xcode, Navigate to "Window-->Devices" and then select your device from the "Devices" tab. 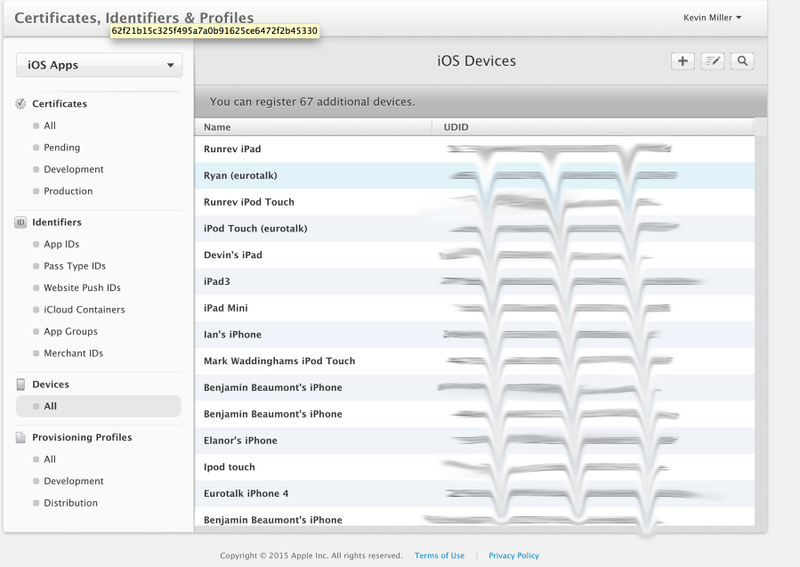 The device id is shown in the "Identifier" entry. 6. Give your profiles a name and then press "generate"
8. Select the Download button from the next screen or from the Development Provisioning Profile you created. This allows you to download the .mobileprovision file. 9. Double click the .mobileprovision install the Distribution Provisioning Profile on your computer. 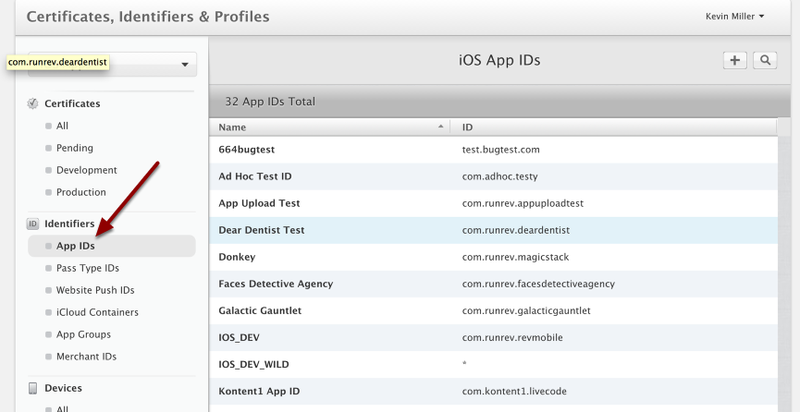 You can now select this profile from the Standalone Builder when building your iOS application. Prev: How do I Create a Distribution Profile for iOS? Next: How do I Submit an iOS App to the App Store? One last comment - for anyone unfamiliar with the Apple environment, it is not obvious what app or site was active to make some of the screen shots. Under each main topic heading it should say what site or app they are talking about, especially when showing screen shots not generated by LiveCode. Thanks for the feedback Red, we'll get these updated. The Basics: How do I Create Hello World on Android? How do I Become an iOS Developer? How do I Develop Cross-Platform in LiveCode? How do I send an email from my mobile device? How do I use multi-touch to move more than one object? How do I use the Question and Password Dialogues in LiveCode Mobile? How do I Capture Images in LiveCode Mobile? How do I detect a shaking motion using LiveCode mobile? How do I implement a multi-touch pinch motion? How do I get the Location and use the Digital Compass? How do I use the Browser Control? How do I use the Date Picker View on mobile? How do I Develop iOS Code for Standard and Retina Devices? How do I use Push Notifications with iOS? How do I make my app scale to fit the screen on all devices? How do I support different device screen densities? How do I use the Picker View on mobile? How do I build an iOS application? How do I Configure the Status Bar in iOS? How do I make a phone call on the iPhone? How do I read/write to files on Mobile? How do I Send HTML E-Mails with Attachments in iOS? How do I use the Question and Password Dialogues in iOS? How do I play sounds on an iOS device? How do I Access Maps on iOS? How do I Create a Distribution Profile for iOS? How do I Submit an iOS App to the App Store? How do I set up an App for Submission to iTunes Connect? How do I Create an Android App for Distribution? How do I use Push Notifications with Android? How do I Create a Self-Signed Certificate for an Android App? How do I implement in-app purchases in LiveCode - Samsung Apps Store? How do I implement in-app purchases in LiveCode - Apple AppStore? How do I implement in-app purchases in LiveCode - Amazon Appstore? How do I implement in-app purchases in LiveCode - Google Play Store?